This tender bouquet of mixed pink and purple flowers is simply stunning, and perfect for any occasion! A pretty violet-hued glass vase adds a charming touch. Send one today just to say "I'm thinking of you." 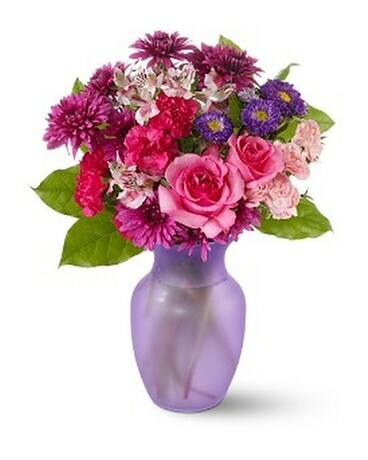 Hot pink roses and miniature carnations, light pink miniature carnations, purple Matsumoto asters and cushion spray chrysanthemums and pink alstroemeria – accented with salal and oregonia – are delivered in a violet glass vase.